"Oceania was at war with Eastasia. Therefore, Oceania had always been at war with Eastasia," Winston dictated into his SPEAKWRITE. "Oceania was at war with Eurasia. Therefore, Oceania had always been at war with Eurasia." He knew, of course, better than this. Over the last fifty years, Oceania had been at war with either of those superpowers, but never before had it been at war with both of them at the same time. Troops had already landed on Oceanias mainland, something that had never happened before. The Inner Party abandoned their habitation to seek refuge in their submarine base. Winston already heard the helicopters and tanks of Eurasia and Eastasia approaching. It would not be long until Oceania would fall into their hands. Welcome to the year 1984! 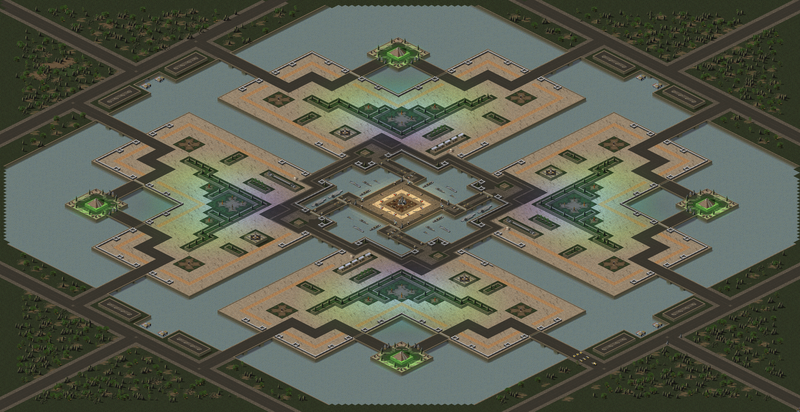 This map features a scenario that was inspired by George Orwell's book 1984. The Inner Party is your enemy on it. They have gathered all their forces in the middle and are defending it with everything they've got! Your only objective is to destroy the Inner Party's Headquarters (represented by the Temple of Nod). The Headquarter is well defended. But this is not your only problem: Oceanias Forces from other continents are pouring in from all directions to stop your Assault on their Headquarters. The Ministry of Plenty: Starves Oceanias people to death so that they don't revolt against the Party. For each ministry you destroy, reinforments on the opposite side cease to pour in. I already like this theme a lot and I plan on improving on it. Right now you will only be attacked by stealth tanks. My plan is that the giant submarine base constantly spawns new missile submarines and attacks the player with it as well so players are attacked by land, sea and air (yes there is a nuke strike every 4 minutes, however it only deals half of the construction yard's health as damage). Sadly the tunnels for the bridges don't work and the ships get stuck. I'd really appreciate if you could fix this problem as I really think this map has potential for Coop play, as well as PvP. Please also tell me about your perceived difficulty. Did you manage to destroy the Headquarters in the middle or were you overran? I'd like to make it as difficult as humanly possible as a coop mode, but it also has to be balanced around pvp, so I don't know if it may be too hard for PvP. Even if allied with 7 hard AI, it's really a tough nut to crack, but I feel it should be exactly that way. It must be difficult in my opinion. There are several ways around, but all of them are dangerous. 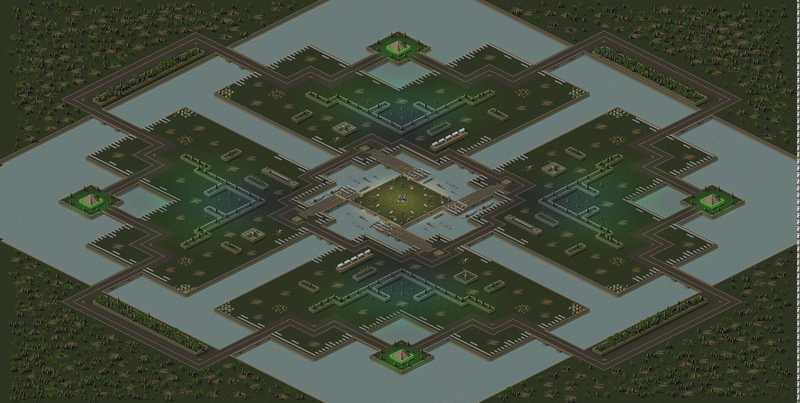 The middle is defended by ships and artillery while the outer circle is constantly swarmed by elite stealth tanks. Some details are repetitive, but it's definitely not bad for a first map. The idea is interesting, although I wonder how well it works in PvP in practice (for example, if the attacks are too strong, it might be more of a fight against the AI than a fight against other players). But I think it should work if the attacks are configured carefully so they can deal damage while not being excessive. I'm busy right now, I'll write a more detailed reply when I can (unless another staff member gets into it first, which is likely). Okay, thanks for your quick analysis. The idea was that it's an artificial island. Therefore all lines are straight by intention. I couldn't find more artificial looking textures so I went with the temperate one. Although I'd like to make it look like a military platform that was built in a way that is easy to defend. If you have any suggestions to make it look less repetitive while still retaining its artificial and symmetrical look I'd be glad to adapt them. Thank you for your feedback. I'm going to improve upon it and upload the new version. I will split it into two versions. One for PvP and one for Coop. I noticed that if an ally is destroyed in a full 8 Team, the game immediately ends. Do you know if I can make the map a full 8 player Coop map or does it always end if someone is defeated? If it's not possible I have to make a 4 player Coop map out of it instead and reserve the 8 player version for PvP. The problem is that whenever any player dies, the game checks whether there are any enemies left in order to determine whether the game should end and if all players are on the same team, there are obviously no enemies left. So 8-player Co-Op maps are impossible, since there needs to be at least one enemy AI player present. Alright, that explains a lot. It was not a problem, however, until some of my AI allies died. When they were still alive and I managed to achieve the objective by destroying the headquarters in the middle, everything was fine. But I see how unreliable that is. Sombracier mostly covered what I meant with repetitive terrain; the biggest mistake is that you've used the same Debris / Dirt piece (under all those trees in the forests) way too much. You should use Ground -> Ground 2 instead, from the tree view on the left in FinalSun's user interface. Ground 3 is also fitting for detailing terrain below forests. Another thing is that your map lacks pre-placed tiberium and ore; lone tiberium trees without any tiberium around them look silly. You can place tiberium and ore from the Overlay & Special menu, or by going to "Special / Overlay" -> "All overlay" in the FinalSun tree view. The "all overlay" list might look scary at first, but it's easy to handle once you get used to it; green tiberium pieces in the list are called "RTIB", blue tiberium is called "QTIB" and ore is called "ZORE". Aside from the things Sombracier mentioned, there's also that near the center, some of the walls that protect the Tesla Coils are floating in mid-air. that is very constructive feedback. I agree, tiberium trees without tiberium around them look strange. However, for gameplay reasons I wanted to make the island's resources as rare as possible. Two players per island have to share their blue tiberium and can otherwise only access one ore mine. This is because it is a coop map first and the attacks from outside would become meaningless if there were much more ressources. Right now, with all the ressources there are it is just enough to build a small defense to fend of those stealth tanks. I'd have to increase the number of Stealth Tanks attacking when I add more ressources to compensate the difficulty, but I noticed heavy lag when there were too many units at the same time, so I try to keep the number as low as possible. What do you suggest? Creating a one tile ring around those tiberium trees? As for the corners, that sounds like a good idea. I'll place a small tiberium or ore field in the middle of the corner, between each island. If too many units cause lag for you, then what about the ton of power plants you placed at the side of the map? For starters, there aren't nearly enough power draining structures on the map to require that many advanced power plants: 10 advanced power plants should already be just enough. Or if you want, you could also make the solar panels and possibly the water purifiers provide power instead so that players could destroy those in order to disable the defenses. That is a good idea! The example with the forward command is brilliant! I'll try it later. But the other idea with the solar panels and the water purifier is even better. Reminds me of Star Wars (on the ice planet, Hoth I think) where they have the shield generator outside of the base (pretty stupid xD). Of course destryoing them would be far too simple, so I need to think of some way to make it harder. Do you know how I can use the solar panels and the water purifier as energy sources? What is their name for the ini file? 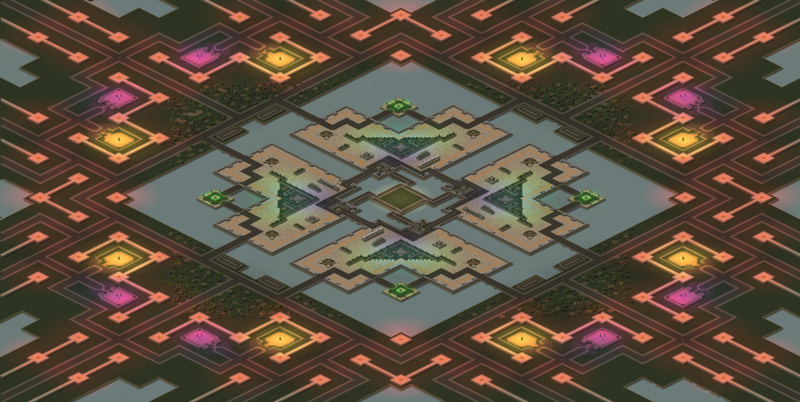 And most importantly, how can I change the name and health of map objects like Vega's Pyramid? Is there any way I can give it the name of the four different ministries? Also they need to have far more health than they do now. So it's only possible to have one name per object? It's not possible to have 4 similar looking buildings with different names? To find the [ID] of a structure, you can simply simply hover over that structure in the map editor and read what it says in the lower left corner of the window. Mind that if you do this however, the structure will have all the other properties of the structure you're changing the image of. So you'll at the very least want to add the Strength= and Armor= keys with the values of the structure of which you're using the image of (or possibly use Immune=yes and LegalTarget=no if you want to make the structure indestructible). it got new textures as well as new enemies. -Personaly, I'm not a fan of the "Grass -> Brick Floor", maybe you should try some transition title between these grounds ? -I noticed two Nod obelisk at South East, why there are no obelisk at S-W / N-W / N-E too ? -I noticed you have tried something at North West with "Ground 2 and 3", why do you stop ? I'm sorry I've been inactive for so long. I've finally managed to pick up my old map again and improve it with some textures in the middle, made it bigger and gave it more tactical depth as a skirmish map. Ultimately this map should also be used as a coop map where you essentially defend the middle against an enemy siege from all sides. I still need to do ground textures on the outer side and place trees and objects, but I'm quite satisfied with the map layout so far. Any feedback on the new version? How do you like the roads? Those are the routes for enemy reinforcements in the coop mission, so enemies will travel there from outside to the inside.